I hope there’s no need to explain the current Pokémon Go craze. It has well and truly smashed download records in the short time since its release, and has become an obsession for people of all ages. This is a global phenomenon, with Pokétrainers everywhere desperate to catch ‘em all. 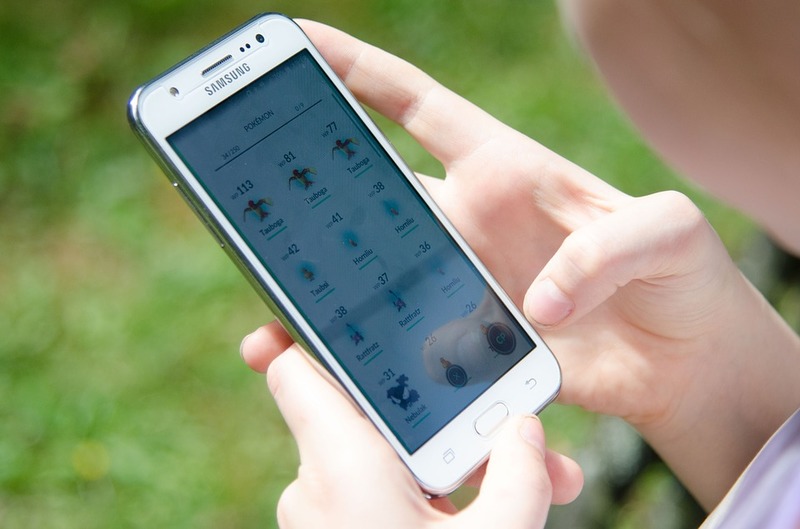 The game’s popularity is showing no signs of slowing down, leading businesses everywhere to scratch their heads and brainstorm ideas for how they can engage Poké-addicts. Pokémon Go uses AR (augmented reality) technology to incorporate all your favourite Pokémon into everyday scenes, which means playing involves a lot of walking around to collect Pokémon and various items, visit Pokéstops and train in Pokégyms. While many are celebrating the health benefits of getting people up and out, businesses are also finding cause to rejoice: areas around Poké-landmarks are flooded with players. The game is so big that many companies are realising that it is worth working the needs of Pokémon Go players into their marketing strategy. There are a few different ways you can succeed with this, and it’s all about thinking creatively to engage the players’ competitive spirit and satisfy their on-the-go needs. 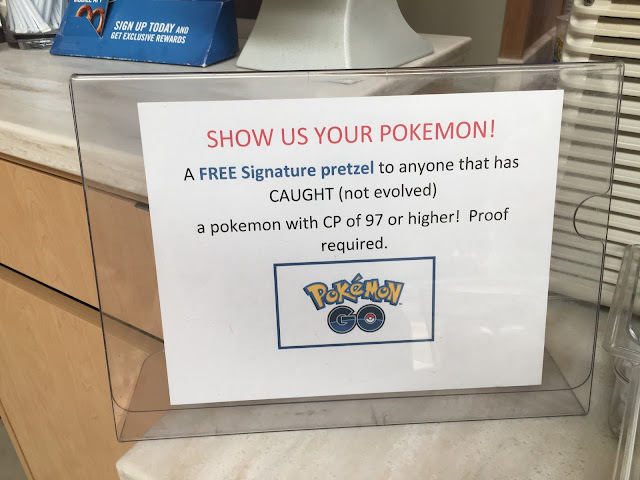 An easy way to dip your toes in the Poké-marketing pool is to embrace the Pokémon world: play music from the show periodically on the sound system, hide pictures of Pokéballs around, offer giveaways to owners of ‘Pokémon of the Day’, and donate your wi-fi code for training. Pick a side. Pokémon trainers all choose to belong to one of three teams when they reach level 5 – Instinct, Mystic, or Valor. Members can be fiercely proud of their team. 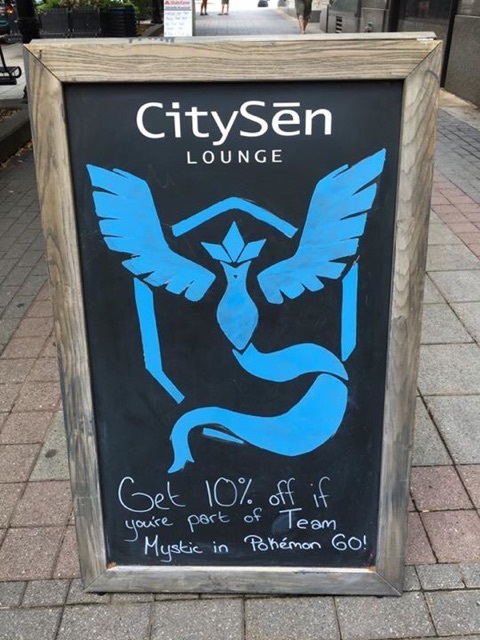 You can tap into this team spirit by branding with team colours to show your dedication, or offering a promotion for those belonging to the team that holds the nearest Pokégym. 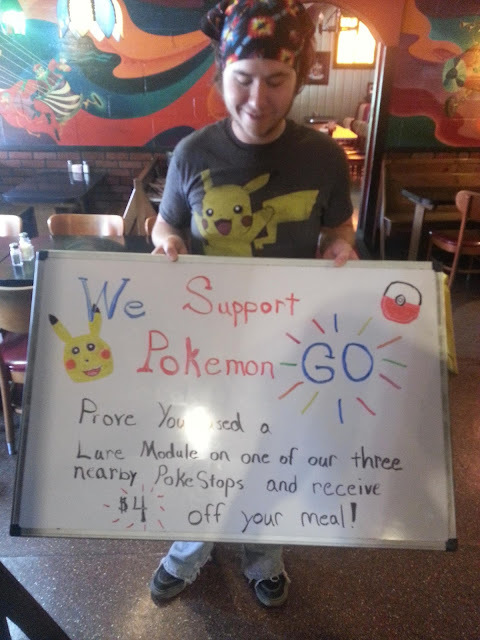 If your business is close to a Pokéstop, you might consider buying a lure module. Lures are available to purchase on the app, they last for 30 minutes, and as the name indicates they lure Pokémon towards the Pokéestop’s location. Unlike a lot of Pokémon Go play, this feature benefits the whole community, attracting more opportunities for all. They only cost a few bucks and it could well bring a flood of consuming players your way. 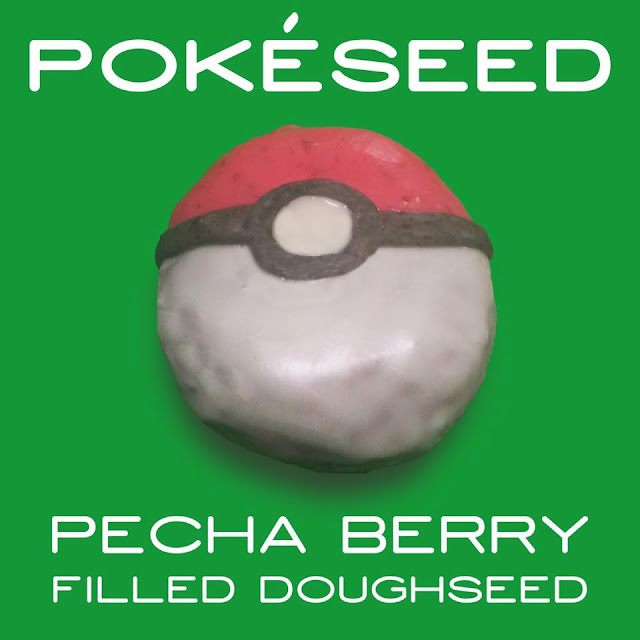 Planting a lure reaches out to trainers via their in-game needs, and all Pokémon trainers need physical sustenance for their adventures, so are likely to drop by restaurants and cafés near a Pokéstop. You can think tactically and place lures to coincide with promotional or peak times. Despite efforts to improve it, the game is still known to be a massive drain on trainers’ battery power. Alerting players to your power-charging facilities or portable battery packs could well attract customers. There is no limit to ideas for promoting food and drink – for effective engagement, try to incorporate characters, teams and iconography into your advertising strategies, and don’t be afraid to get specific with your challenges or promotional criteria. This pretzel seller appeals to the players’ technical knowledge, rather than making vague claims. Part of the game’s success is down to how easily it transfers into online culture. From sharing your proudest catches and linking in to your fanatical team page’s news, to spreading Pokémon-related memes and screenshots, there is a hell of a lot of online Poké-activity. You can join in by sharing images, sightings of rare Pokémon, experiences, and even being creative with your own branding, like this business tweet. Another idea is to hold a Pokémon photo contest, where players submit their favourite in-game moments for a prize. This has a lot of appeal for players who are dying to share their hilarious screenshots and anecdotes. You can add easily your logo to the images, using a free tool like Canva, and get your brand some exposure. One aspect players really enjoy about the whole Pokémon madness is the sense of community. Parties and events around the game’s theme are popular because suddenly we all have no trouble finding something to talk about. It’s easy to bond over the experience and exchange stories of your adventures. Consider partnering with other businesses in your area to put on an event, or tournament. These can take various shapes, like offering a prize to the player who collects the most Pokémon or who is the holder of a gym after a set time period. You can have fun challenging customers, and giving out discounts or freebies if they can defeat you in battle. The key is to connect with the swathes of people who are loving the Pokémon experience. This is a massive point of cultural interest with a multi-generational, amazingly broad appeal.